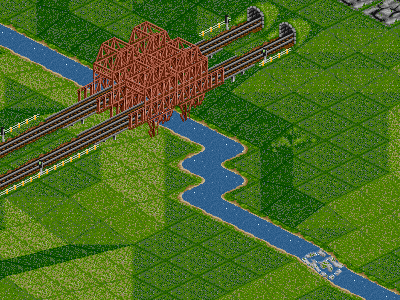 Since r11926 OpenTTD supports rivers. Of course this is a very interesting feature which we should have a closer look at. OpenTTD doesn’t support rivers in the first place, you need Michael Blunck’s rivers.grf (in the download section). If you do not use this grf file, rivers will look like canals and the rapids will have grf glitches. You can only build rivers in the scenario editor.